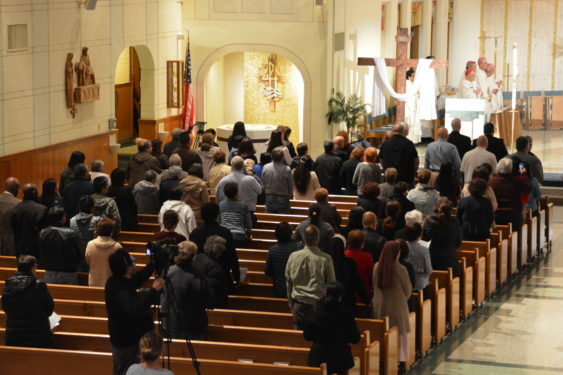 The Diocese of Brooklyn, in partnership with survivors of sexual abuse by members of the clergy, held the fourth annual Mass of Hope and Healing April 25 at St. Nicholas of Tolentine Church, Jamaica. “This is important for the healing process – healing for survivors, for the victims, and healing for the Church,” said Luis A. Torres, Jr., a lawyer and member of the Diocesan Review Board. The board on which Torres serves reviews all reports of alleged sexual abuse by clergy to evaluate whether they find them to be credible or not. It is part of the ongoing efforts of the diocese to seek justice and healing for victims and survivors and to prevent these horrible experiences from being repeated in the future. 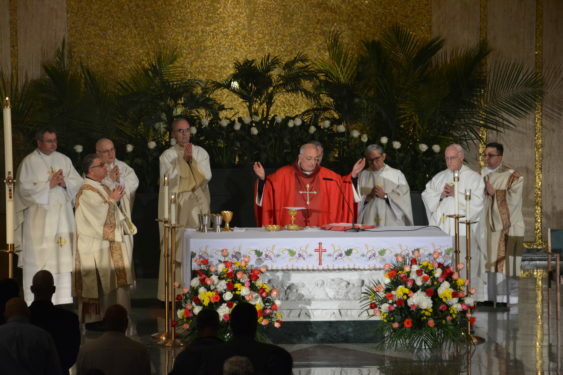 Auxiliary Bishops Octavio Cisneros, Raymond Chappetto, James Massa, Paul Sanchez, and Witold Mroziewski, and almost 100 priests and deacons from Brooklyn and Queens accompanied Bishop Nicholas DiMarzio at the Mass, which was attended by about 120 victims, their families and friends. The Eucharistic celebration was broadcast live on NET-TV and streamed on the internet to allow the participation of survivors who didn’t feel comfortable attending. At the end of the Mass, Anthony Hughes, who was abused by a member of the clergy when he was 13 years old, gave a moving testimony about his suffering, but also about the changes his sees in the Church. He said that when he came forward in his 20s, it was a very difficult thing to do and that he got “mixed reactions,” but he found two priests willing to listen to him and help him. He said that both of them were present at the Mass. “I have met Bishop DiMarzio more than once,” said Hughes. “We know each other pretty well. Our meetings have been very interesting. We have definitely talked about difficult topics. But one thing is for sure – the bishop does not shy away from topics that I raise and always has been willing to fully discuss them with me and I appreciate that. He concluded on a hopeful note. “I have good days and I have bad days, sometimes several bad days back to back to back. But what is different is that I no longer have to rely just on myself during those bad days. I know I now have people that care, people who will support me, guardian angels, and I have a bishop and priests that will pray with me and for me,” he said. The Victims Assistance Ministry can be contacted at 718-623-5236 or at vacministry@diobrook.org.